This is the third recipe I have tried from this month’s Vegetarian Times, and let me tell you, it makes a ton; if you don’t love beans, this one is not for you. I had fun making this; the fresh thyme was so pretty to look at, and I enjoyed nibbling on the raw fennel too. Plus, the kitchen smelled divine while it was cooking. Again, my ingredients didn’t quite add up to what ole VT listed: it calls for 1/2 large or 1 medium fennel bulb, which is supposed to dice up to 2 cups. I got what I thought was actually a large bulb and used the whole thing. Only 1 1/2 cups though. (sigh…there seems to be a trend here) SO – when you make it, get some extra fennel. Not everyone likes it raw, but if you do then it can’t hurt to have some left over for snacking. 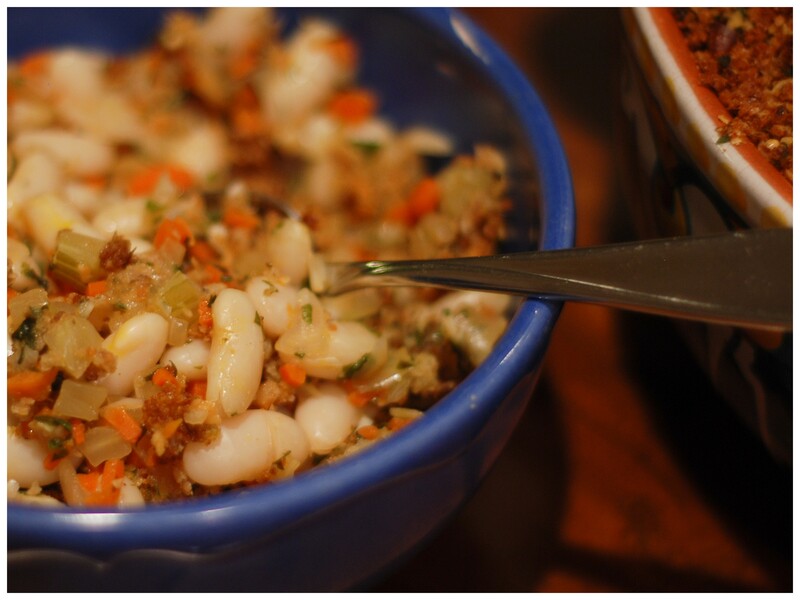 It’s hearty enough to use as a main dish – if you like beans. My husband isn’t a huge fan, and his suggestion was that it needs more of the “other stuff” in it. In my opinion, more herbs and/or spices wouldn’t hurt it either, but when you have a bite with the topping mixed in, it’s very good – and there’s actually a lot of it (the topping) to go around. I think it would be better if paired with the dishes the magazine featured; Rosemary-and-Balsamic-Roasted Grapes and Olives, and a Tricolore Salad with Roquefort and Hazlenuts, (garsh, those sound mouth-watering, don’t they?!) but I didn’t make those. Not enough time AND…no one but me would have eaten the grapes and olives. I’ll wait to make those when I pull the rest of the beans out of the freezer in a week or two. 1. Soak beans in large bowl of cold water overnight. Drain. 2. Put beans in 6-qt Dutch oven & add enough water to cover by 2 inches. 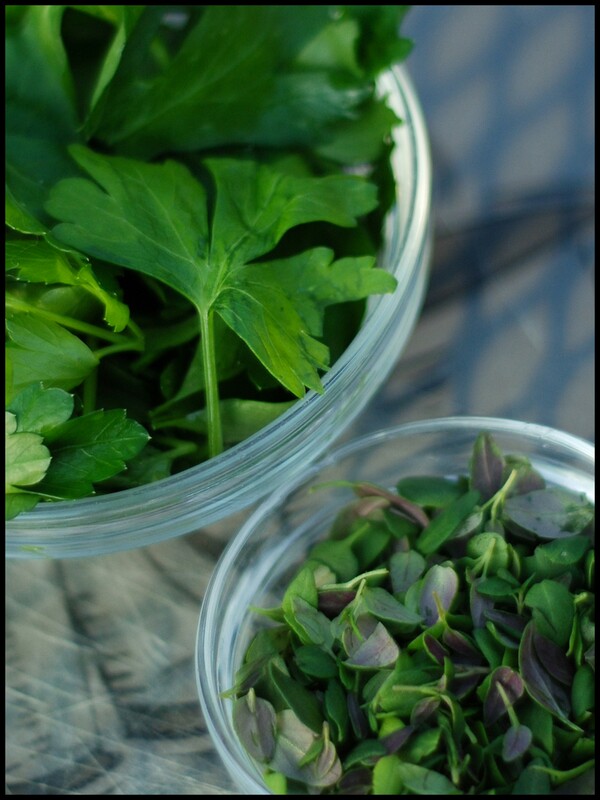 Tie together thyme and parsley sprigs and add to pot. Pierce onion with cloves and add to pot. 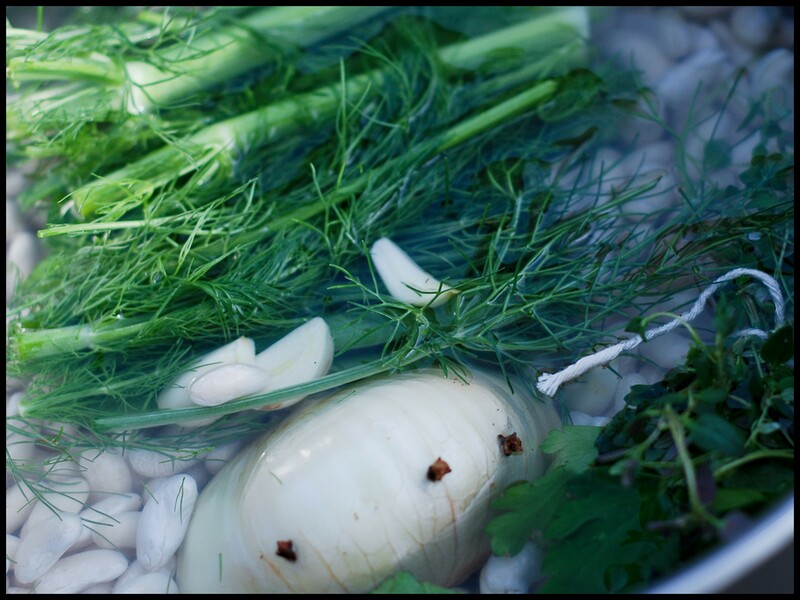 Add fennel fronds & stalks to pot with 6 halved garlic cloves. Partially cover, and bring to a boil. 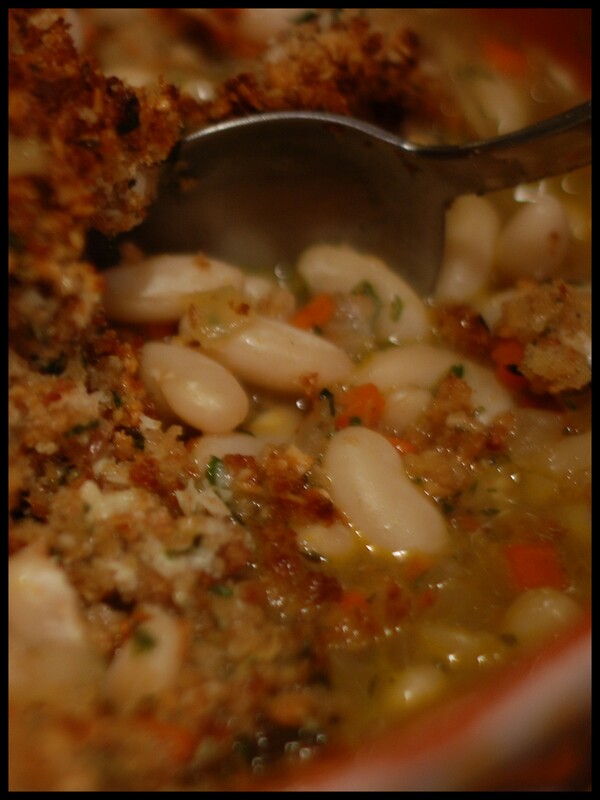 Uncover, reduce heat to med-low and simmer 35-40 minutes, or until beans are just tender. 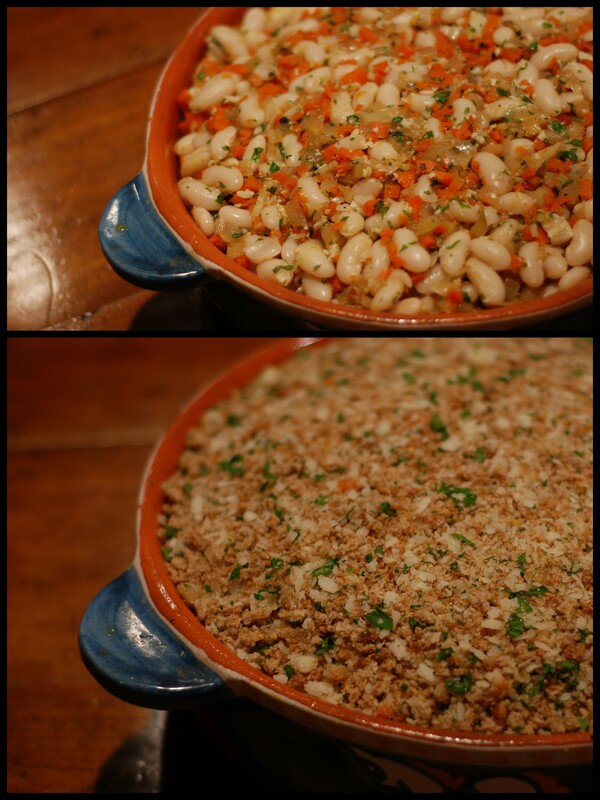 Drain beans, and reserve cooking liquid. Discard herb bundle, onion, and fennel. Wipe out Dutch oven for next step. 3. Preheat oven to 400. Heat 2 T oil in Dutch oven over medium-high heat. 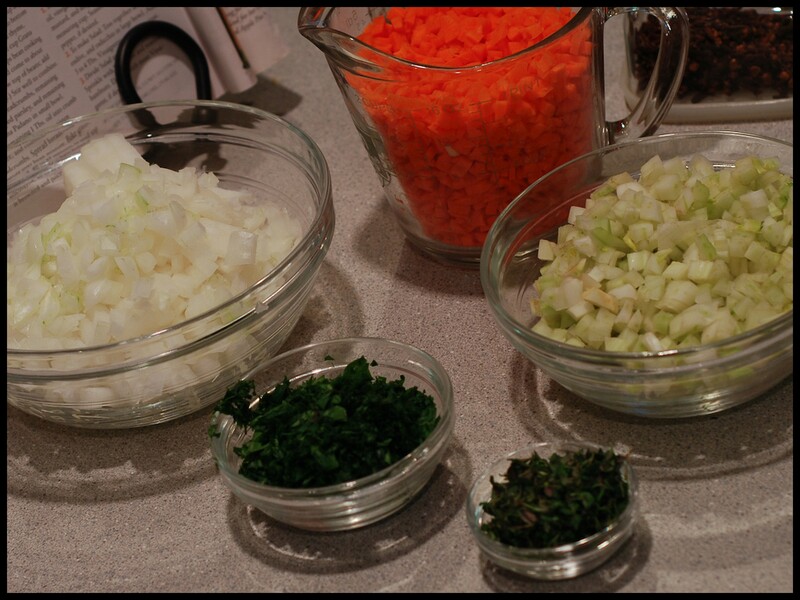 Add carrots and diced fennel, and season with salt, if desired. (I didn’t, but it might have added a little more depth if I had) Cover, and cook 10 minutes, or until beginning to brown, stirring frequently. Add diced onion, and cook, covered, 6-8 minutes, or until onion is soft and bottom of pan is browning, stirring occasionally. Add minced garlic, and cook 1 minute, or until fragrant. Remove pot from heat, and stir in vinegar, using spatula to scrape up any browned bits of onion stuck to bottom of potl Add beans, chopped thyme, 2 T chopped parsley, 1/2 cup cheese, and 1 1/2 -2 cups bean cooking liquid. (Liquid should come to about 1 1/2 -2 inches below top of beans; add more if necessary.) Stir well to combine. ...and ready for the oven! 4. Combine breadcrumbs, remaining 1 T parsley and remaining 1/4 cup cheese in small bowl. Drizzle remaining 1 T oil into crumb mixture, and combine to moisten breadcrumbs. Spread breadcrumb mixture over bean mixture. 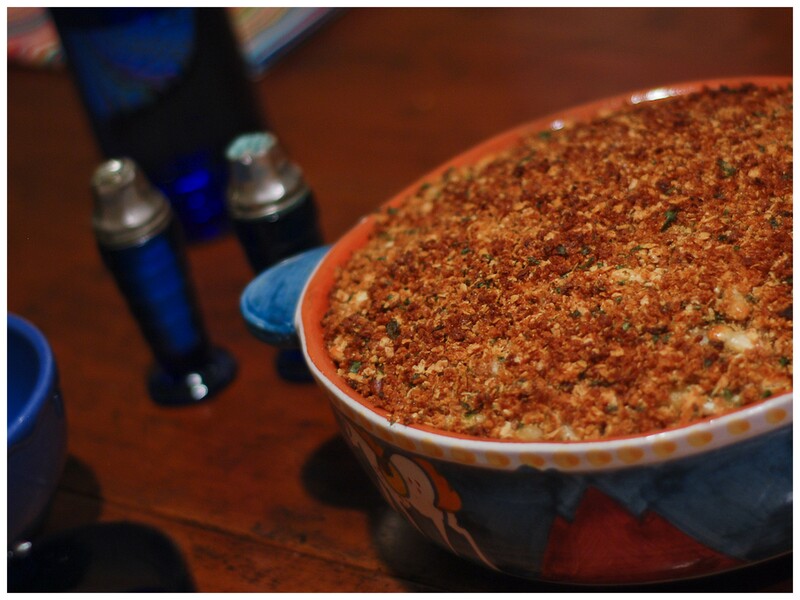 Bake gratin, uncovered, 40-45 minutes, or until top is browned and juices have bubbled down below surface, leaving brown rim around edge of crust. Cool at least 20-25 minutes to allow beans to finish absorbing juices. Serve warm. Again, a huge nutritional hit from the VT, and it will make your kitchen smell fabulous while it cooks! Estimated nutritional value is per 12 1-cup servings. From the oven to the table - let's eat!